Anushka Manchanda is no stranger to Indian audiences. After her stint with reality television as part of India’s most popular all-girl band Viva, the singer has enjoyed a successful solo career, and is now a part of electro-rock outfit Shkabang. Anushka is known to be quite the foodie, and we caught up with her for a quick chat about some of her favourite things to eat. 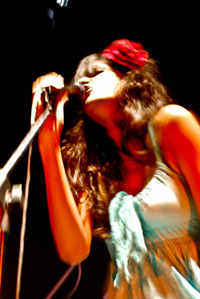 Anushka Manchanda, live at Blue Frog, Mumbai. Photograph by Nitesh Nitesh. I have honey and hot water when I wake up every morning. I think it cuts fat, I’m not sure. That’s what they say. I add a little lemon to it, and it soothes my throat in the morning. When I wake up, I sound like a guy, which is why I hate recording in the morning. I always tell music directors that they should call in the morning if they want male vocals (laughs), otherwise after 12 o’clock, please! I love aloo. Potatoes. Any kind of potatoes. French fries, mashed potatoes, aloo ke parathe, aloo ke pakodey, jeere-waale aloo, every kind of aloo — I love it. Indo-Chinese food is awesome. It has to have garlic chicken and be red in colour. Add the egg fried rice to that, and the chicken drumsticks, or lollipops, or whatever. Chilli chicken is alright, but the sweet garlic chicken just rocks my world. And you can’t get this at any fancy place; you can only get it at those sidey Chinese joints. I’m a big south Indian food fan. I can have idlis all the time, every time, any time. At a time I can eat at least four idlis. I could eat more, but usually there’s always something else with the idlis, like dosas, uttapam, or something similar. I like sushi. I remember, the first time I ate sushi was in Dubai. I was at this fancy restaurant, and at the time, I had never eaten sushi before. The whole idea of raw fish made me go “yuck”. Then I saw this plate being passed around, and everyone was like “Oh, sushi, la la la”, and they offered it to me, and I didn’t know how to eat it. You’re supposed to put in a certain amount of wasabi and dip it into the vinegar; you eat the ginger in the middle to clean your palate between different kinds of sushi, and that sort of thing. There’s a [right] way to eat it, and I had no idea. So I just said that I don’t like sushi, it’s so horrible! (laughs) But now I enjoy eating it a lot. By Urvashi Bahuguna · Award-winning young writer Aditi Machado talks to us about her writing and what the future may hold for her.